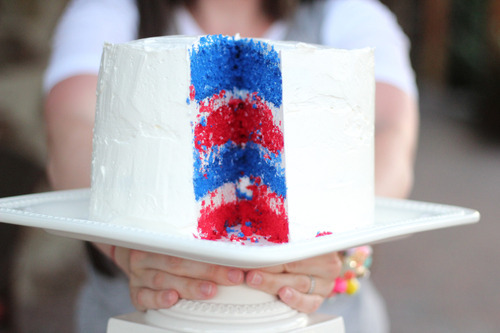 WARNING: This cake is NOT for the faint of heart! It’s a little time consuming to make and requires PATIENCE! But WOW is it worth it! 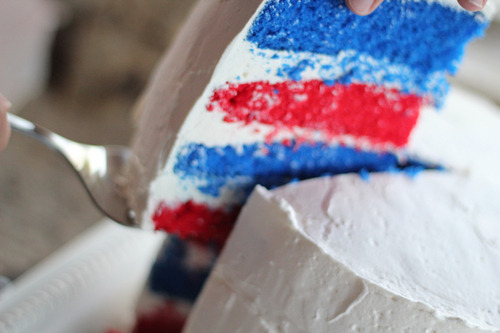 It is super duper rich and makes a beautiful finale to a Fourth Of July Bbque! Preheat oven to 350 degrees, pam sides and bottom of four 9 in round cake pans. Mix 1 bowl with 2 tbs red gel food coloring(make sure it is gel based, regular food coloring won’t give you the vibrance) and pour into 2 of the prepared cake pans. 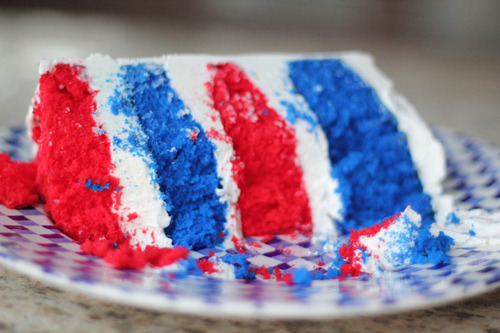 Mix other bowl with 1-1 1/2 tbs royal blue food coloring and pour into other 2 cakes pans. Bake for 24-30 minutes, cool in pans for 15 minutes, then turn out on cooling racks. Note: If you don’t have four 9 in cake pans laying around just do 1 cake mix at a time cutting the ricotta cheese and almond extract in half. Once you have turned the 2 layers out on cooling racks, repeat with 2nd mix. Once sugar has dissolved,(about 3 minutes) pour into stand mixer and let whip on high speed until cooled to room temp. Meringue will be thick and stiff peaks. Mixture will get soupy, don’t panic. Mix on high for about 5 minutes until buttercream rethickens. If it isn’t thickening, put it in the fridge for about 10 minutes. Then resume beating on high until thickened. I promise this will work. Place first layer on cake plate and put a thick layer of buttercream on top and crumb coat the sides. Add next layer and repeat until all four layers have filling and the sides have been crumb coated. 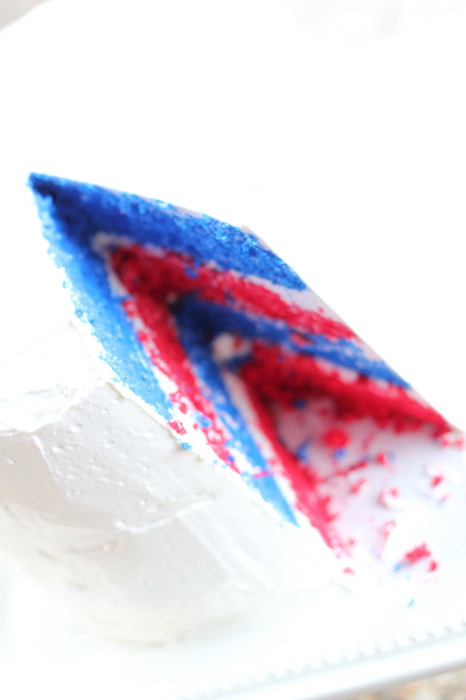 Note: Crumb coating is the process of spreading thin amounts of frosting around a cake to trap any cake crumbs from being exposed through the frosting. Very important when you are making cake layers that are darker than your frosting. Put the crumb coated and filled cake in the fridge to firm up. Repeat buttercream recipe ONE.MORE.TIME! I told you it was time consuming! :) Take your chilled cake out of fridge and frost! 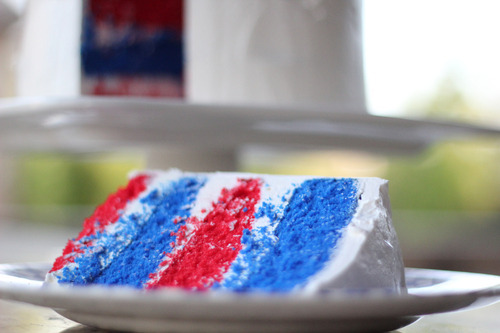 Original cake idea from the Whisk Kid. She did a 6 layer rainbow version that is INSANE!